Definition at line 35 of file desktop.h. Definition at line 37 of file desktop.h. Definition at line 259 of file desktop.cpp. Definition at line 301 of file desktop.cpp. Definition at line 269 of file desktop.cpp. 277 /* Imagelist icons are missing if MainFrame::Create() is called directly from here! Definition at line 46 of file desktop.h. 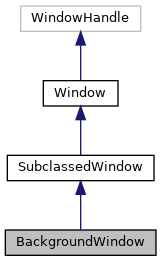 Referenced by BackgroundWindow(), and WndProc().